Your Irresistible Free Offer (IFO) is how you can capture the contact information of prospects who visit your pet sitting business website. Author’s Note: This post was originally published in 2014. I’m republishing it now with a new video and updated with all my current experience and tips! Think of the Baskin-Robbins’ iconic pink spoon. This is their IFO, which gives their customers a free taste of ice cream, so they can decide which flavor they want to buy. Ingenious! When somebody visits your site, they should see your offer and say, “Oh that’s really enticing, I’m going to give them my email address for that.” And then you email them the irresistible free goodie that you promised. Why do I call it irresistible? Because it needs to be just that. A free walk or a free meet-and-greet is just not going to cut it anymore. People don’t want to share their email addresses. Their inboxes are flooded already and they are only going to give you their email address if it’s really something juicy. Your IFO should give your ideal customer something of value. It also needs to be tempting enough for them to part with their email address. Your IFO should be displayed on each and every page of your website, along with an opt-in box, where your prospects will give you their first name and/or email address in return for what you’re offering. My first tip is that I have had the best luck with high-value coupons. I’ve tried PDFs, I’ve tried giveaways, I have tried everything under the sun. What I can tell you is that a high-value coupon with a whole number (rather than a percentage off) has given me the best conversions. 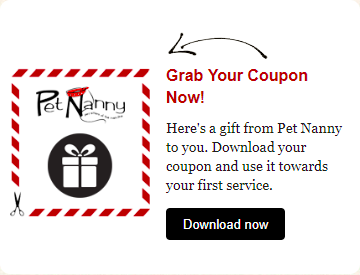 Currently, Pet Nanny is using a high-value coupon. The offer is shown on each and every page of my website. 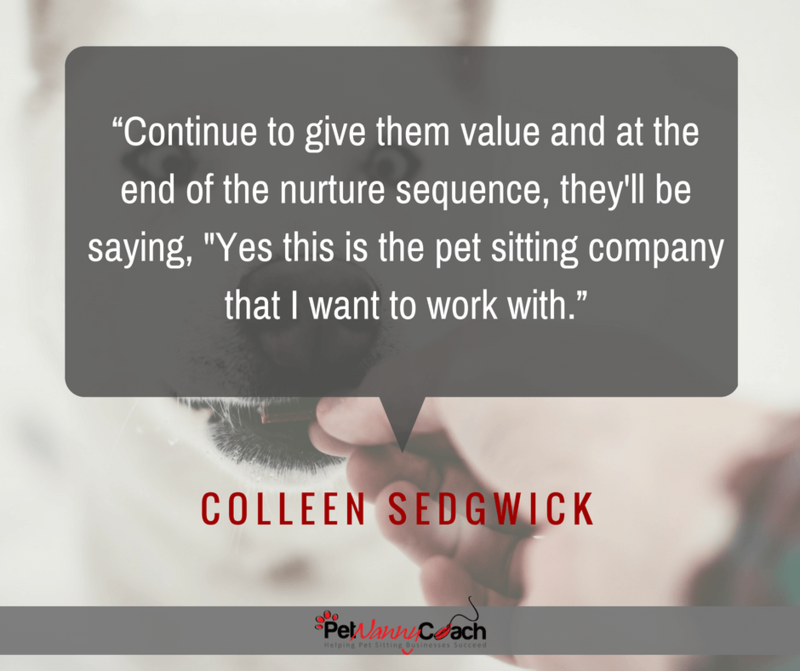 After your prospect gives you their contact information in return for your free offer, they become a “warm prospect.” You should have a well-thought-out, automated follow-up process called a “Nurture Sequence, which gives these prospects added value and makes your pet sitting company the only logical choice to hire. Throughout the sequence, you are going to let them know all about you and your business, and continue to provide value. For instance, I offer my list an Ultimate Guide for Mainline Pet Owners, which has all things pets for people that own pets on the mainline. Things like pet-friendly hotels, walking trails, the best vets, the best pet stores. The Ultimate Guide is also a great place to feature my referral partners. I add the businesses that refer me to the guide that I give to my prospects. This is your strategy. When someone hits your website, they see the enticing high-value coupon, they give you your email, you put them in your email nurture sequence and tell them all about you and your amazing pet sitting business. Continue to give them value and at the end of the nurture sequence, they’ll be saying, “Yes this is the pet sitting company that I want to work with.” That’s the strategy behind it. These are great questions and valid concerns. I totally get it. But when you identify the lifetime value of your customer, you’re going to understand that offering something like $25 off on the front end is going to be well worth it. To calculate the lifetime value of your customer, look up the total amount of revenue that your business has made thus far and then divide it by the total number of revenue-generating clients. That will give you a number. This is your average lifetime value of each customer, and how much a customer is going to spend with your company. I have had customers that have spent $50,000 with my company, and I have had customers that have spent $200 with my company. So what we’re looking for is the average. So you might think, “Oh my gosh, if someone’s going to spend $2,000, $4,000, $5,000, whatever with your company, do you think it’s worth it giving them $25 off the front end?” I’d say so. I think it’s a really good strategy and definitely well worth it. But you know, your client lifetime value may be lower. You might not have as many lifetime clients or as much lifetime revenue as I do. So figure out what your actual client lifetime revenue is and determine what amount is worth it for you. You want to identify what is enticing and juicy enough to get the ball rolling and get them in the front door with your company. So to recap, your irresistible free offer is something juicy, something compelling, something that’s going to make your visitors take action and give you their email address. Then, you drop them into a nurture email sequence where you educate them about your company. Your homework is to calculate your average lifetime customer value (calculate the amount of money your business has made divided by the number of lifetime generating customers) and identify a high-value coupon amount to offer. All right guys, I hope you found this helpful, go think of an awesome offer and put this strategy into action in your business right now. If you like this video, please share it and hit the like button. I’d love to hear about it and as always, I’m available to answer any questions you may have in our free Facebook group at PetNannyCoachcommunity.com. Come visit me there and add #ask to your questions and I’ll do my best to answer them all! Finding time to work ON your business can be a challenge for pet sitters looking to grow their businesses. The bottom line is that your busy life is always going to get in the way, whether it be children, illness, social engagements or most commonly for pet sitters…. visits, dog walks and overnights. Lack of time can most definitely be an obstacle for growth, and I wish I had an easy answer on how to hurdle it, but here is the truth… You do not get results from things you don’t implement. What does this mean? It means that you are not going to see results in growing your business if you don’t take the time to learn and then implement what you have learned in your business. There is no magic pill. You have to do the work. I went five years running myself ragged and making a very average income while doing it. One day I thought to myself, “what is the point of all this?! I have no life, and I have no money.” I knew if I wanted to grow my business and achieve financial success, not to mention gain my freedom my back, things had to change. I completely removed myself from the actual pet sitting part of the business. I found that the best way to makes sure I have the time to work on my business was for me to hire a staff to take my dog walks and pet sitting duties off my plate. Don’t freak out! I’m not saying you have to remove yourself completely. What I am saying, is that you need to schedule the time to work on your business and to market your business. You hire someone to cover all of your dog walks and visits one day per week and then you commit that one day per to working on your business. You hire someone to cover all of your weekend visits and then you commit your weekends to working on the business. You keep your midday clients, then hire someone to cover the pet sitting visits. Now you have your mornings and evening free to work on your business. Most importantly, you schedule your time to work ON your business. Marie Forleo said it best, “if you don’t schedule it, it’s not real.” Your good intentions to do something it not good enough. By actually plugging your marketing time into your calendar, you are much more likely to do and complete the work. If you’re thinking your business just isn’t ready to hire yet, then my suggestion is to make more time out of the time you already have. Hire a housekeeper: Perhaps it’s time to delegate a different duty – Housework! Hiring a different form of help: Such as a Bookkeeper, Client Happiness Manager or Social Media Manager. Change your schedule: Get up earlier, stay up later or forfeit TV time. Your Homework Assignment: Once you find the time to market your business, schedule it! Do you ever feel like your business has peaks and valleys? Meaning, you may have an influx of clients for a few months and then all of a sudden you hit a drought, and your left wondering, “how did I get here?” This phenomenon is very common in small business, and it’s due to a lack of consistency with your marketing. So, what’s the answer? Most business owners think they shouldn’t market if their business is flush with clients. This is incorrect thinking! To always have clients you must always be marketing. You must count on the fact that you are going to lose clients. People get laid off from work. They have babies. They move. They divorce. You should not count on the fact that customers are yours forever once they sign up with your service. You must implement a variety of marketing strategies to create a consistent pipeline of new business. You must also effectively market to your current customer base to increase customer retention. When you successfully do both of those things, your business revenues will increase dramatically. Your Homework Assignment: Map out you marketing calendar a year in advance, so there is absolutely no guesswork. You will know exactly what you should be doing week to week to attract new clients and to increase the revenue from your current customer base. Negative online reviews matter! Many consumers make their buying decisions based on a company’s online reviews. My advice for you today is to try your very best to turn those negative online reviews around to work in your favor. Personalize the response by using the customer’s name. Would you be frustrated if this happened to you? What would it take for you to feel better about the situation? Don’t make things worse by writing something negative back, out of anger. Make sure you have calmed down and are thinking rationally before writing back. Regularly solicit customer feedback. If your customers believe that you truly care and want to hear from them, they will be less likely to post a negative review without first coming to you for a resolution. Encourage your happy customers to write positive reviews and showcase them on your website, in your newsletter and on social media. Your Homework Assignment: Create a system where you are consistently soliciting feedback from your customers and encouraging positive online reviews. As a pet sitter you are in the customer service industry. I’m sure this isn’t news to you, but customer service is one of the most challenging fields to work in. Sometimes certain “personalities” just make you crazy! Today I have some tips for dealing with those difficult pet sitting customers who drain your time, your energy and your sanity. Tip #1: Get crystal clear on exactly what type of problem client you’re dealing with and then take appropriate action. Are they the high-maintenance client who just demands top-notch service and won’t let the tiniest mistake slide? These types of people are why we are in business. They may be difficult to work with at times, but they hired your professional service because they wanted a professional company that will do the very best job. They only want the absolute best for their furry pals. They are good pet sitting customers who are happy to pay you for your superior service. They are also the people who most likely tell everyone they know about your awesome or not so awesome service. They are your squeaky wheels that demand the grease. Unfortunately, these are the peeps that you’re just going to have to grin and bear it with. 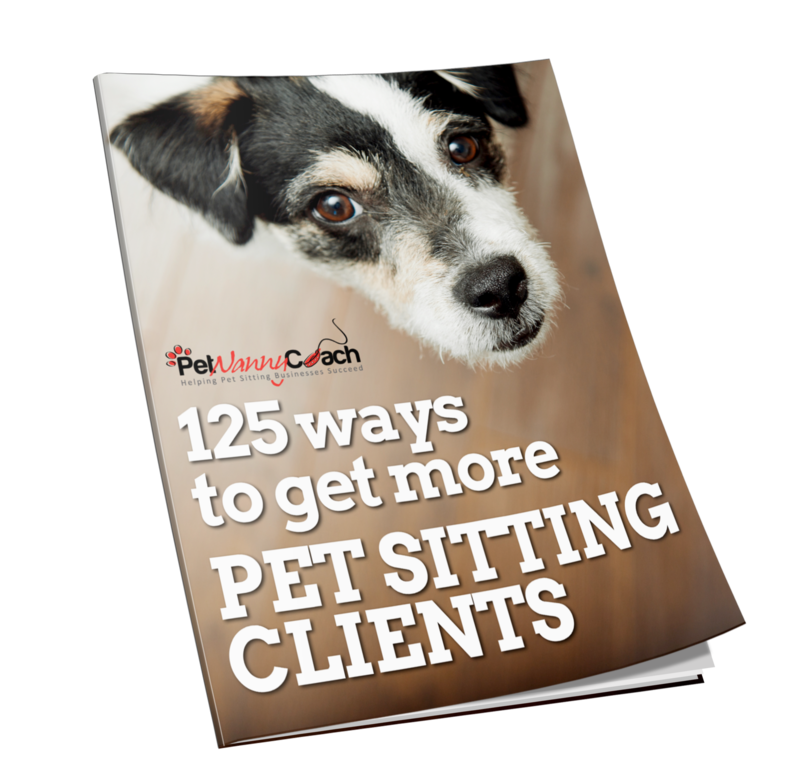 Tip #2: Set clear boundaries and expectations with your pet sitting customers. Are they the type of client who cancels without notice and demands a refund or continuously schedules last-minute? Write a warmly worded email reminding the client of your policies and procedures. Create a web page that you can easily refer these people to where they can see your policies under your company header written in black and white. Institute a fee schedule for these types of clients. Create a 24 hour cancellation policy: If 24 hours notice is not given of the cancellation, then the client gets charged for the visit. Create a late booking fee: If the client does not give 24 hours notice of scheduling a visit, a $10 late booking fee is added to their service order. At Pet Nanny we first waive these fees as a token of good faith and then send them the email making note of our policies with a link to the policies web page. This system will shine a good light on your business while also keeping your clients informed. You are creating expectations and boundaries with them. Tip #3: Master the art of writing a warm email and pursue the path of least resistance. Are they the type of client who is simply a jerk? Are they rude to you and your staff? Does your stomach drop every time they call or email? Pursue the path of least resistance. Master the art of writing a warm email that tells them in the politest and nicest way possible that you will no longer be able to service them for “X” reason. Examples you can use are; you no longer service their neighborhood. You had a sitter quit unexpectedly, and you don’t have coverage at this time. You’re downsizing, etc. The key is to make it super duper nice. I don’t think it is necessary for you to have a confrontation. IMPORTANT: If you’re not comfortable with the suggestions given above and you feel it necessary to address the situation head on, DO IT ON THE PHONE. Do not put anything in writing that could later be used against you or published somewhere. Good luck! I know that unleashing heart sick clients is not an easy task, but I promise you will feel so much better after you cut ties. The “heart sick clients” are truly not worth it. Trust me on this one! Social Proof is one of the most powerful and low cost marketing tools that you can use for your business. What I mean by “social proof,” are testimonials and rave reviews from your current customers. The best part about testimonials is that they do all the selling for you, and it costs you nothing. Testimonials from happy clients will put your prospects more at ease about working with you. First, I want for you to create a “follow-up and testimonial request system” to start gathering testimonials from your customers. After each and every service order you will want to follow-up with your customers and gain their feedback. Then, if they were happy with their service, request a testimonial. TIP: Ask your customers for pictures of their pets to go along with the testimonials. People LOVE sharing pictures of their furry pals. Second, I want you to create a page on your website that is solely dedicated to rave reviews from your current customers. Third, start posting the rave reviews on social media. Fourth, go to www.fiverr.com and have an attractive PDF created with your best of the best reviews to give to client prospects. Your Homework Assignment: Create and implement the system that I just explained above in your own business.